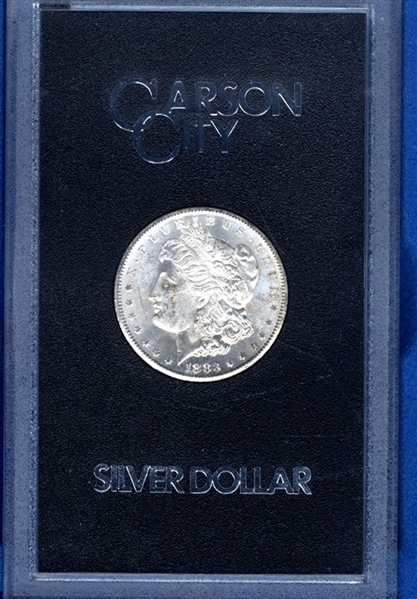 This Morgan silver dollar is uncirculated, has the CC mint mark and housed in the original presentation box as sold by the US government in 1973. This one actually has its serial number government certificate and its original box. On Dec 31, 1970 President Nixon signed the Bank Holding company Act which included a provision authorizing the General Services Administration to sell the silver dollars. In 1971 the Treasury turned over the remaining silver dollars to the General Services Administration. They were stored at the Bullion Depository at West Point, New York. The GSA held five mail-bid sales of Carson City Mint dollars and two fixed price sales of general mixed dollars. They were encapsulated in hard plastic holders with a black background and packaged in a cardboard box as you described.